As Queen of Tuvalu, Her Majesty has a unique relationship with this cluster of islands: home to one of the world’s smallest democracies. In all of her duties relating to the country, The Queen speaks and acts Queen of Tuvalu, not as Queen of the UK. She keeps up-to-date with local affairs via her Governor-General and Government ministers, and maintains an important symbolic role in Tuvalu, appearing on stamps and coins. Visits throughout Her Majesty’s reign have also helped strengthen ties between the Royal Family and the people of Tuvalu. Tuvalu has what is known as a ‘constitutional monarchy’ with The Queen as Sovereign. This means that Her Majesty is not involved in the day-to-day business of Tuvalu’s Government, but she continues to play important ceremonial and symbolic roles in the life of the nation. The country celebrates The Queen's Official Birthday on the second Saturday in June, often coinciding with celebrations in the UK, and also has a public holiday in November to celebrate the Prince of Wales's birthday on Heir to the Throne Day. Her Majesty is represented in Tuvalu by a Governor-General who is appointed on the advice of the Prime Minister and is entirely independent of the British Government. The Queen acts entirely on the advice of her Government ministers in Tuvalu. The Queen's Royal style and title in Tuvalu is Elizabeth the Second, by the Grace of God, Queen of Tuvalu and Her other Realms and Territories, Head of the Commonwealth. Members of the Royal Family have been welcomed to the islands of Tuvalu throughout The Queen’s reign to celebrate the relationship between the nation and its Monarch. 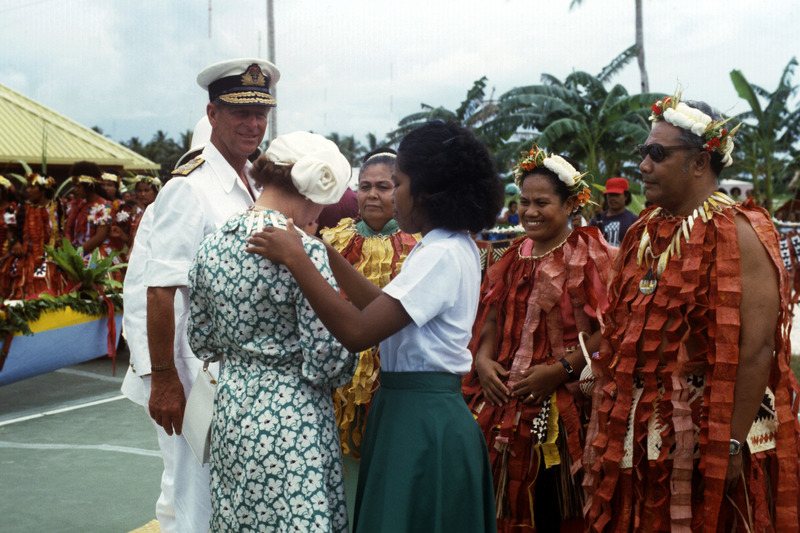 The Queen and The Duke of Edinburgh visited Tuvalu in September 1982 as part of a month-long visit to Australia and the Pacific. A fleet of local canoes brought the Royal guests to the island, which were borne aloft and carried ashore. The friendship between Britain and the people of Tuvalu has existed for the best part of a century, and this has been further strengthened since you became an independent member of the Commonwealth in 1978. I am very glad that my first visit to your country should be as Queen of Tuvalu. Her Majesty and His Royal Highness attended a feast held in their honour and watched local dancing and sports. They toured the hospital, local schools and other important community buildings, and installed the corner-stone of a future Parliament building. Royal Highnesses dressed in colourful grass skirts to join in with traditional dancing, and The Duke even tried his hand at a local sport similar to volleyball but played with a coconut.